It was with deep shock & sorrow that we heard of the death of Bob White, 52, on Saturday 22nd March at King George V playground, during a game of football. The funeral service took place on Tuesday 1st April 2003 at noon in St Paul's Church, Shurdington, and was followed by cremation at Cheltenham Crematorium. A wake was also held in his favourite haunt, King George V Playground in Shurdington. Way back in 1937 a movement was started in Shurdington for a Playing Field. In June 1938, a scheme estimated to cost £750 was circulated to each Elector in the Parish, and approval was given by a Parish Meeting to raise a loan of £400 towards the cost. By August 1938, the Ecclesiastical Commissioners had agreed to a sale to the Council of 6.623 acres of Glebe Land at a cost of £480. Arguments then took place between the Council, the Solicitors and the Vendors, regarding restrictive covenants, Vendors Solicitor's costs, etc. Hard knocks were given and received. A lease of the land was offered on the one hand and compulsory purchase threatened on the other. 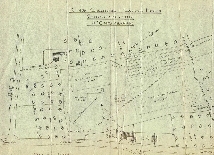 However, by the end of June 1939, a draft conveyance had been settled and application was made for a loan. It was now the turn of the Ministry of Health to delay, and on the 15th December 1939, they wrote refusing the loan owing to the outbreak of War. On the 4th March 1940, the Ecclesiastical Commissioners sent the Conveyance to the Council for execution. The Council had no money to complete, without the loan, and thus ended the Parish Council's first effort. After the War the Parish Council had to enter into a fresh contract and also pay another £100 for the field. Restriction on borrowing made a loan impossible. The Fund Sub-Committee then came into being and by May 1948, handed to the Council a cheque for £500. With the subscriptions already in hand of £160 the Council now had no need for a loan. It is not possible to set out here all the details and set-backs which were experienced up to the final conveyance to the Council on the 16th June 1948. 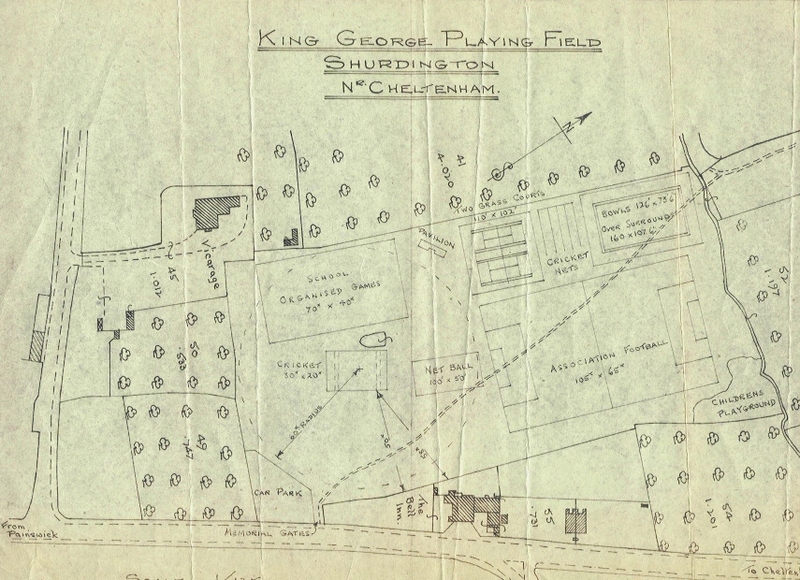 Thanks to the grit and determination of the people of Shurdington to acquire this particular field, it is now theirs, vested in the Parish Council, as a public playing firld and recreation ground to be known forever as "KING GEORGE'S FIELD." A Layout has been agreed to provide Cricket, Football, Hockey, Netball and School organised games areas. Children's corner, Tennis Courts, Bowling Green, Car Park and Pavilion. The official opening finds the Council at the completion of the first stage of their scheme. Introduction by F W J Holliday, Chairman of the Shurdington Parish Council. 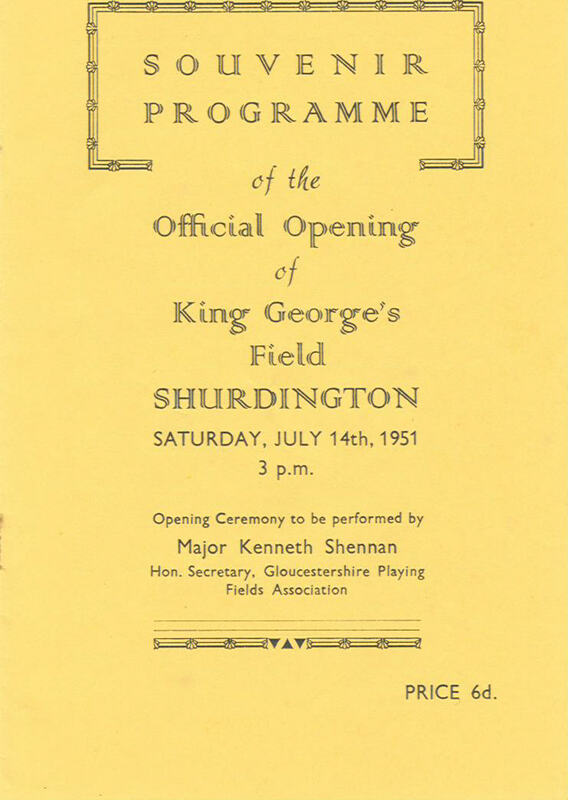 Opening of the King George's Field by Major Kenneth Shennan. A. G. Bishop, Esq., MBE will thank Major Shennan on behalf of the Playing Field Committee. 3.15pm Cricket Match: Shurdington Cricket Club versus Coombe Hill Cricket Club. 4 pm CHILDREN'S SPORTS. Entries to be made on the field in accordance with announcements which will be made over the loud speaker. 4.45pm DISPLAY BY GIRL GUIDES AND BOY SCOUTS by kind permission of Mrs Christie and Mr Trainer. 5 - 5.30pm Cricket Interval. 6 pm Country, Community and Morris Dancing. 7 pm GRAND CONCERT in the marquee (Book in advance). 9.15pm CARNIVAL DANCE in the Village Hall. Announcements will be made over the Loud Speaker.